Lagavulin 16 Year Old is a crowd favourite among scotch drinkers. It made it to the last chapter of my book, when I answer the "what's my favorite whisky" question (somewhat ironically). Lagavulin Double Matured is part of a limited number of whisky that the distillery releases outside of the popular 16 year old expression. It’s, essentially, fan whisky for people that love Lagavulin. Marketers will tell you that a great story will connect with consumers moreso than a great product. Big distilleries from Scotland and Kentucky have been using this logic from the very beginning with stories of prohibition, the "evil" taxmen, and family history. The problem with today's crowded whisky scene is these stories start sounding the same. Russell's Reserve is the premium brand of whisky from Wild Turkey Distillery. If you've been reading my reviews, you'll know I've loved everything that comes under this label. Russell's Reserve Straight Rye is priced at $30 and is readily available. Complaints of a bourbon shortage do seem overblown with whisky like this that's easily available. I could barely finish the generous pour of Amrut Portonova I first poured. This isn't an everyday drink. The thick oaky texture was on par with Icewine. Instead, it's a drink for special occasions with flavour you won't quite experience anywhere else. Amrut Distillery is located in Bangalore, India. The distillery has a long history of distilling various spirits, but it wasn't until the last few decades that they started to focus on producing whisky. The first whisky from the distillery to get international notice was the Amrut Fusion–one quarter peated barley from Scotland, the rest Indian barley–fully aged in Bangladore. I covered it back in 2011. The hot Indian weather changes the formula for whisky barrel maturation. Winters in Scotland and Kentucky slow down the chemical process during colder months. In India, maturation never slows, and this makes age statements irrelevant. While molecules are more excitable at higher temperatures, the humid weather means less water evaporates compared to alcohol. The results make for a different type of whisky. While I'm simplifying the challenges of whisky making in warm climates, Amrut fully understands this complexity. Instead of producing whisky that tastes familiar to scotch drinkers, they make excellent whisky with their own character. The distillery has the luxury of using different types of barrels over the maturation of the whisky. Amrut Portonova took a journey back and fourth between new oak barrels and barrels that were previously held in bourbon. This back-and-forth process was done to taste. The whisky was then transferred into 40 year old sherry pipes for 9 months before the whisky finally went back to the bourbon barrels again to balance out the flavours. When tasting Amrut Portonova, one needs to acclimate with cautious nosing and small sips. The nose is surprisingly light considering the flavour, though there's plenty happening. You'll get forward dried fruits and distant burnt orange citrus, along with spice. There's a lot of new oak to this drink, such as with a well aged bourbon, and that'll become apparent on the nose. The palate accelerates in flavour. The taste starts sharp with caramel sweetness that's nearly entirely masked by the heat and spice of this drink. You'll get the expected vanilla and caramel, sure, but the peppery spice is out of this world. The sweetness evaporates off the tongue toward the middle of a taste. The finish is long, spicy, with some dried fruit. Amrut Distillery managed to create something new with this one. This is a no-age statement whisky, and a really great example of how little age matters in the high-end whisky world. Masterson's Straight Rye Whisky is one of treats I reach for on rare occasion. It's not the most expensive bottle of whisky in my cabinet--far from it--but this premium line of rye whisky that's not always easy to get. The story of this Canadian rye crosses the boarder into the United States. A Californian company with a century of wine making decided to delve into high-quality spirits so that it could be sold along with their wine. 35 Maple Street is the spirit division of The Other Guys, which is related to the Sebastiani family in California. Master's Rye is 100% rye made at the Alberta Distillery in Calgary, bottled in California and sold through-out North America. It's considered an artisanal whisky; aged 10 years in new white-oak casks, and distilled in a pot still for plenty of flavour. The whisky is named after the American William "Bat" Masterson that is described on the bottle as a gambler, buffalo hunter, army scout, gunfighter, and newspaperman. The name has no relationship to the whisky, but the old photo of William Masterson (along with his story) on the curved attention-grabbing bottle is a nice stroke of branding. I'm not against clever branding to get people to buy the whisky as long as the product itself is of high quality. And it is. Most whisky is column distilled whisky blended with pot still whisky. Column distillation is incredibly efficient, but it also cuts out much of the flavour from the grain. For a mild-flavoured smoother whisky, column distillation is excellent, but I'm biased toward whiskies with more personality. Pot stills are less efficient at distillation, allowing for larger molecules (some of which that provide flavour) to evaporate up the still and condense along with the alcohol. Pot still whisky is more expensive to make compared to column still whisky. Masterson's is 100% rye and pot still whisky, and that's represented in the price. The attention grabbing nose is sharp with fresh citrus, barnyard dust, and floral notes reminding me of perfume. An unripe banana might similarly perk up your senses, though this is slightly heavier with sweetness. The first sip needs to be gentle to truly appreciate this drink. It starts out as a complex tune that settles through your mouth. Vanilla flavours from the wood are so very light, certainly considering this is a 10 year old new oak aged rye. Instead, rye-based peppery spice really takes hold of your tastebuds after a few short moments. Notes of liquorice turn beneath the spice. The complexity of this drink is wonderful, and takes you through natural earthy flavours leading into a long dry finish. You'll taste plenty of peppery-spice on the end, enough to tickle the top of your throat, and as the rye sugars settle on your tongue along with an pleasant oils. You'll be left with a rewarding warmth. Some find 100% rye whisky too harsh on the palate, but Masterson's style is far more delicate by comparison to cheaper ryes. With so few bottles left here in Ontario, I can only hope that Masterson's will return. By the time you read this, I've likely already purchased another bottle (Or two). The problem with most affordable (cheap?) blended scotch comes from the utterly boring base flavour. While single malt scotch is made strictly from malted barley, blended scotch is mixed with distilled corn and possibly wheat. The result is a cheaper drink, with a dull vanilla flavour that's common among many brands in the $30 range. With the introduction of Three Ships at the LCBO, I may have found my "cheap" drink. It's not a scotch, but it is a South African distilled whisky that has been blended with whisky from an unmentioned distillery in Scotland. The blend of Scotch whisky with South African whisky is no gimmick. There's a light smokiness present here that no-doubt comes from Scotland. The whisky has been aged at minimum of 5 years. While that's young for a Scottish whisky, in South Africa the climate is significantly warmer. This hastens the chemical process of whisky maturation compared to the cold climate of Scotland where aging is near dormant during the cold winters. Faster isn't always better. Different components (water, alcohol, etc..) evaporate at different rates and the wood is less challenged by warmer climate, but in the case of this blended whisky, the results are fantastic. I've put this drink up against many single malt and blended scotches of double the value in a blind taste test, and this whisky enters the category of 'Not quite as good as these others, but damn it's good!' At half the price for nearly as good of a product, this drink is an easy favourite. The praise from my blind tasting with friends is not unique. Three Ships has been earning many awards internationally including praise from Jim Murray of The Whisky Bible. Three Ships Whisky has a history going back to 1850 when Captain James Segwick landed in South Africa. By 1859 he started a company in his name that provided liquor and tobacco to the area. In 1886, he purchased the distillery in Wellington South Africa located about an hour outside of Cape Town. The distillery has since been upgraded, and currently there are over 70,000 casks of whisky maturing. As mentioned, Three Ships 5 Year Old Blended Whisky is a blend of Scotch and South African whiskies in combination of malted barley and grain whisky, which could be wheat or corn. While the distillery is vague on the details, we can assume that the slight peatiness comes from Scotland. It's nice to see this drink bottled at 43% ABV. For me, when a distillery bottles at a higher alcohol content, often they're demonstrating their faith in the strength of flavour of their product. While 40% ABV is the minimum for whisky, too many distilleries see this as the default alcohol content. The nose starts with mildly charred wood for peat, with the brightness of a freshly peeled orange, and some raisin-like sweetness. If you wait long enough, you'll get shoe polish notes. On the palate, the flavour hits immediately with sweet notes of caramelized orange peel and a touch of vanilla. Just as you think you'll settle down for a normal blended whisky, nice levels of oaky spice ramp up. There's an almond fattiness to this drink, and while the complexity builds up, the charred wood smokiness settles down through the middle and fades nicely into the finish. The finish is a combination of peat, spice, and dark chocolate. If there's any complaint, it's the bitter notes that come out the longer you wait. By many standards, Three Ships whisky is not going to be as good as blends double the price, but it's quite possibly close enough that you won't care. The LCBO has a limited supply of Three Ships Whisky. I recommend stocking up. Forty Creek Distillery has deep roots in winemaking, with a passion for whisky. Recently I had the pleasure of doing a private tour of the distillery that included a tasting of the full product line. To mention the history of the distillery is really to speak about the owner and whisky maker, John K. Hall. A native of Windsor, Ontario with a passion for whisky, Hall grew-up dreaming of working for the local distillery, Hiram Walker. When it came time to start his career, things didn't work out as he envisioned. Instead he received an opportunity to pursue his other great passion, winemaking. Hall would spend 20 years as a winemaker, but as much as Hall loved winemaking, his first love was whisky. So when he heard Reider Distillery in Grimsby planned to close he cashed out his shares in Cartier (where he worked) and bought the distillery renaming it Kittling Ridge Estate Wines and Spirits. As a winemaker with a lifetime of experience in Niagara, he continued to produce wine, but his true love was whisky and his childhood dream was something he couldn't deny. The whisky business, however, is hard to get into. Unlike wine, which can be ready in as little as a year, a good whisky requires six or more years of aging. Hall ran both businesses in parallel, but is currently going through what he describes as the bittersweet process of de-emphasizing and likely divesting his wine business. It's something you can literally see on the building as the signs and the company have been recently rechristened Forty Creek Distillery—indicating that going forward the focus is all on the whisky. Forty Creek has a loyal following, and for good reason. Hall takes his knowledge as a winemaker and applies it to whisky. For example, in winemaking there are three noble international red grapes: Cabernet Sauvignon, Merlot, and Cabernet Franc. Winemakers are able create some of the most revered wines in the world by making them separately and then carefully blending them together with an artistic touch. Hall sees a similar parallel with whisky having three noble grains: corn (used in bourbon), barley (used in Scotch), and rye (traditionally used in Canadian whisky). All Forty Creek whiskies use all three grains. Hall distills each separately and treats them differently during the aging process, charring the barrels from light, medium to heavy depending on the grain. He believes this approach allows him to bring out the best in each grain, and he doesn't blend them until the last stage when the whisky is 'married' in a barrel for at least several months before being bottled. It's a very unique approach in the whisky world. American Bourbon distillers begin their whisky making process with a mix of grains (mostly corn with some wheat and/or rye and/or malted barley) called a mash bill and Scotch distillers use only malted barley. Hall explains that if he made his wine with that approach, fermenting a mix of different grape types altogether, the result would be muddied with the wine never reaching its full potential. Tasting through the line-up with him, you begin to understand why he goes through the extra effort of trying to coax the best out of each grain before blending. I had the pleasure of doing a deconstruction of the whisky, tasting barrel samples of each of the three grains, and it proved his point. Each of the single grain whiskies are expressed uniquely in the final blend. The corn-based whisky offers a thicker, creamier, more interesting mouth-feel; the rye adds a fruitiness and a longer spicier finisher; and finally, the barley adds citrus and nutty notes. Forty Creek whisky is widely available at the LCBO. The original, award-winning whisky, is the Forty Creek Barrel Select ($25.75), which takes the blended whisky and finishes it in sherry caskss for up to six months. New to the line is the Copper Pot Reserve ($28.45), which is blended heavier on the rye and makes for a flavour profile closer to a 'traditional' Canadian whisky. When walking through the large barrel warehouse (it holds 20,000 barrels), I noticed a few that had "Hold for John" written across them. Hall noses barrels for two or more hours a day, and occasionally he finds a barrel that peaks his interest—those are marked “Hold for John”. These barrels are later used in his reserve line of limited edition products, and are typically released annually. The Forty Creek Confederation Oak Reserve Whisky, is one of those and it's currently available at the LCBO ($69.96). This special edition Forty Creek is finished in barrels made from 150-year-old Canadian white oak trees sustainably harvested from a forest near the distillery. Hall explained that the trees have a denser wood grain due to the colder Canadian climate, offering a unique Canadian terroir. Forty Creek has a fantastic story behind the whisky, and a whisky maker that's truly passionate and obsessed with making a fine product. It's something you can experience yourself taking one of the complimentary tours and tastings held at the distillery from June to September. 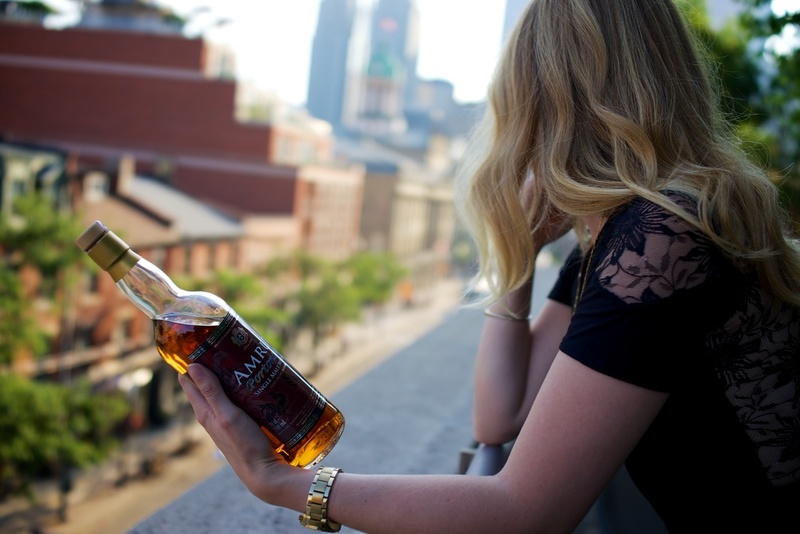 “I didn't set out to make just another Canadian whisky,” Hall said. After spending an afternoon tasting with him I can confidently say he succeed. Duncan Taylor is an award winning independent bottler in Scotch, and the maker of Black Bull Blended Scotch. I had a chance to visit them earlier in the year, not realizing at the time that their rather modestly size bottling facility was among the largest among Scottish independent bottlers. Independent bottlers purchase barrels of whisky from distilleries. They then age these casks in their own facilities, and bottle the product based on when they feel it is ready. Bottlers like Duncan Taylor have a wide range of Scotch available. They have barrels from most of the large distilleries, and they also have barrels from distilleries that have long-since closed. Duncan Taylor specifically is said to be one of the largest private owners of whisky casks, including barrels of Scotch that are over forty years old. They're also the maker of the award winning Black Bull 12 Year Old Blended Scotch Whisky. While single malt Scotch must be 100% malt barley, blended Scotch is typically part malt barley, and part grain, offering a smoother, sweeter whisky. In the case of Black Bull 12, the blend is 50% malt and 50% grain. While sweet, it is also bottled at 50% alcohol. Black Bull quickly became a favourite go-to in my whisky cabinet, so much so that its quantity has declined quickly since my purchase. I have a feeling this will have a regular appearance in my whisky cabinet (Sidenote: As with most products I seem to review, this one is also on the 'limited supply' list at the LCBO). So how does it taste? The nose is a little sharp, but quite welcoming with milder notes of vanilla, cereal, and caramel. The latter scent reminded me of a light bourbon. On the palate the nose carries through with similar flavours, but with more depth. There's a nice spice to the drink, and you can taste the woodiness. The palate is heavier with caramel and dried fruits, and the finish is long and sweet with a touch of bitterness. As mentioned, it is bottled at 50% but I don't feel that is obvious when drinking it. Green Spot Irish Whiskey is a surprising and fantastic addition to the LCBO’s shelves. This is a premium Irish whiskey*, and that's reflected in the price of $84.95. It's the type of Irish whiskey that I like to see: one that fights the (incorrect) stereotype that Irish whiskey is only a cheap alternative to single malt Scotch. Irish whiskey has the reputation for being a cheaper alternative because of the grains they use. Single malt scotch is limited to malted barley by law, whereas Irish whiskey is typically a blend of malted barley and other grains. This makes it closer to blended Scotch over single malt Scotch. Just as there are fantastic blended scotches, there are also fantastic examples of Irish whiskey. Booker's Kentucky Straight Bourbon is a cross between a whisky cabinet novelty item and a drink to be taken seriously. The novelty part comes from it being one of the (if not the) highest alcohol content drinks you can buy in US and Canada (63.4%). On the other hand, it's a bourbon to take seriously because the distillery manages to succeed in bringing flavour to an otherwise overpowering combination of alcohol and barrel aging. I've been wanting to feature the Amrut Fusion on the Whisky Cabinet since I first had a taste last year, but it just kept selling out far too quickly from the LCBO shelves. This shouldn’t be tooo surprising: Amrut Fusion was rated the number 3 whisky worldwide by Bill Murray (author of the annual Whisky Bible, not to be confused with Ghostbuster/Zombie Bill Murray). What is surprising is the distillery location: Bangalore, India. John Maxwell, owner of Allen's, was the ever meticulous host presiding over a rather special lunch in honour of Ian Miller – Glenfiddich Global Ambassador and a true gentleman of the industry. The talk of the day was of Scotch and Ontario wine, and considering what we were about to be served, I rarely have felt as spoiled as I did that day. Upon Miller's arrival, Maxwell produced an old bottle of Grant's Best Procurable Scotch, a bottle stored in his cellar for quite some time. Miller helped date the bottle (since none was printed) to sometime in the late 1930s. Imagine tasting a drink that had been produced in the old way of blended Scotch, undisturbed since the 30s. Ian Miller had the honours of opening the bottle (with the help of a rubber-band tied around the neck of it, as it was being quite stubborn) and having that first whiff of air from the 1930s. This was a truly unique treat, and comparable to my experience tasting Glenlivet's 70 Year Old. Visually, it was cloudy and dark coloured. Glenfarclas is one of the remaining family owned distilleries – in fact, the current owners are direct descendents of the original owners from the 1800s. They folks at Glenfarclas are known for using high-quality sherry casks to age their whisky, and their product ranges from a 10 year old drink to 21 years and more. There's certainly not much splash behind the marketing for Glenfarclas, and the bottle isn’t all that impressive. I’m a bit of a whisky bottle snob, I admit, and while I like the fat whisky bottle Glenfarclas uses, the issue I have is the thick writing on the bottle that makes it look a little cartoonish. The thinner handwriting from the older bottles looked better (in my opinion). For this reason my Glenfarclas is hidden away near the back of my whisky cabinet. That's not necessarily a bad thing, as I’ve reached for it less often and thus been able to enjoy it for longer. It's important to reward innovation and risk takers, especially when that innovation changes an industry and continues to succeed decades later. Maker's Mark has such a history. The original grounds were home to Star Hill Farms Distillery, one of the oldest distilleries in the US, dating back to 1805. After prohibition, however, the bourbon market suffered, with distilleries rushing to produce cheap whiskey and get it out the door as quickly as possible to supply the (now legal) demand. Bill Samuals purchased the distillery in the late 1950s with a new strategy: to produce a quality product with better ingredients. This strategy has clearly proven successful, with the distillery now producing 8 million liters a year, one of the largest producers worldwide. Not bad for a distillery that only produced one product up to recently. Noting the success of Maker’s Mark, other competing distilleries soon followed suit, entering the higher-end sipping bourbon market. The consumer benefited. This bourbon is a relatively new release from the distillery (2006) and has won high praise. While it's more expensive than the regular Maker's Mark, this isn't necessarily a better drink, but rather a drink done differently. Maker’s Mark 46 is produced by taking the original fully matured Maker's Mark, removing it from the barrels, and inserting seared staves back into the barrels. Searing the staves caramelizes the sugars in the wood, and this flavour is transferred to the whisky when it is returned to the barrels and aged for an additional 9 to 12 months. It's lovely on the nose. Vanilla extract and the oak really comes through. The sweetness is nicely balanced, like a toffee flavour that's rich but not too sweet. When tasting this whisky, focus on the "tip of the tongue" flavouring. You'll get that similar oaky and vanilla sweetness that is as perfectly balanced as it was on the nose. There's no bitterness, or dried fruit sweetness. Instead you get a spicy sweetness with a rich mouth-feel. It's not a complex drink in terms of flavouring, but it's far from boring, and at the price point ($49.95 at the LCBO) it's fantastic. This is only the second product that Maker's Mark has released since the 1950s, and so traditional Maker's Mark drinkers are smart to be cautious, but I would definitely recommend this as a complement to your collection. The bottle has a good look to it, though I don't know if I'm a fan of the faux candle-wax seal on the cork and neck. The original Maker's Mark has a good shape, and this one was clearly designed by the marketing team to draw more eyes. Still, I'm willing to forgive that wantonness for attention given the strength of what’s inside the bottle. As a wine lover that was turned to Scotch, John Glaser has been making waves in the Scotch industry by bringing innovations more common in the wine industry to Scotch making. The original batch of the Compass Box Spice Tree was finished in barrels lined with extra oak staves suspended within the cask, a technique often employed by French wine makers. While this method quickened the aging process giving the drink a rich profile, the Scotch association quickly responded threatening Compass Box with a lawsuit: Scotch, they said, needs to use unmodified barrels. Compass Box agreed to stop selling the original Spice Tree, but John Glaser took a different route for the next iteration. The whisky is aged a minimum of 10 years and is a blend from of whisky from a few Highland distilleries, including some aged in first-filled American oak casks and others in re-fills. Compass Box buys these Scotches, blends them, and then ages it an additional 3 or so years in barrels that have heavily toasted new French oak heads. While this finish is much longer than the 6 months with the staves (used in the original Spice Tree that was marked illegal), having had the original I can say that this process provides a similarly rich flavour profile. While John Glaser innovates with the wood used for the production of his Scotch, he is more traditional in terms of not using chill-filtration and he doesn’t add any additives for colour. In that respect, you are getting a true drink, bottled at 46% alcohol. I especially like this, as the trend in Scotch is currently to move down to 40% alcohol as a way of cutting down the price and ‘improving’ the flavouring. I don’t entirely buy the latter argument (though I’m sure it’s true in some circumstances), and see it as a method to increase production yet lower costs, by adding more water to the final product. Compass Box Spice Tree has won a number of awards and is rather popular among a circle of Scotch enthusiasts. The golden amber colour of the Spice Tree is all natural, with no added caramel for colouring. The nose is quite lively with oaky vanilla, sweet cereals and a lingering spice. The pallet is similar to the nose with sweetness from the grains coming through, some honey notes, and spice. There’s a touch of smokiness, likely from the oak, that gives an extra dimension to this vibrant drink. On the long finish there’s a lingering honey sweetness and spice, and a creaminess to the texture that gives this drink a great mouth feel. This is just the type of drink you want to have after a big meal, or during the cheese course of a fine meal. There are plenty of supplies available in the LCBO, but this product is officially marked as “discontinued.” I’m hoping the LCBO brings it back, but in case they don’t, my recommendation is to pick it up soon. The other product from Compass Box is the Peat Monster at just over $60. While I only had this drink once at a whisky show, I quite enjoyed it, and it’s perfect for peat-fans. Compass Box, and John Glaser, are not finished with this product, as they have additional innovations they are bringing to the Scotch marketplace. Recently, a couple of us at Spotlight had the pleasure of participating in a one-on-one tasting with Marc Laverdiere, the Canadian Brand Ambassador for Highland Park, The Macallan and The Famous Grouse. One piece of wisdom he shared with us early on is that, when tasting and choosing a Scotch, it’s not about finding the perfect Scotch, but rather finding the perfect Scotch for the moment. In an effort to bring us closer to the harmony between selection and moment, we had the pleasure of tasting several different types of Scotches. Below are some of the points that I found particularly interesting during this introspective. Barley-based alcohol (which is what Scotch is made of) is, on its own, quite unpleasant to smell and taste. The Scotch that we’re used to drinking benefits from the added flavours that come from the barrels used in the aging process. This is one of the reasons why older Scotches take on more distinctive flavours: they absorb these flavours from the barrels. Saying that, virgin barrels would only provide an oaky touch to the Scotch, and thebarley-based whisky requires more flavour to give drinkers the richness they’re looking for. Macallan, for example, purchases their casks from sherry producers, who use the barrels first to ferment their sherry, and then sell the barrels to other distilleries to be used in the Scotch aging process. Ex-sherry barrels are more likely to produce a rich dried-fruit type flavours scotch, while bourbon barrels tend to produce a softer more floral scotch. During Prohibition, many bourbon distilleries started selling their barrels to Scottish distilleries, and so the American Oak bourbon barrels became popular. As it stands, bourbon barrels are more likely to be used these days because sherry production is fairly low whereas bourbon is produced in great quantities in the US. While many distilleries in Scotland traditionally used sherry casks, the relatively low supply and high demand has made these casks quite expensive. Like in wine, barrels are often reused when making Scotch. First-fill barrels produce the most flavour, and with each re-use, the flavouring decreases. Distilleries often mix the liquid from first-fill with second-fill barrels to produce balanced flavours. An older Scotch is not only aged longer in the barrels, but it is likely to be made with more first-fill barrels as compared to a younger Scotch. The type of wood also enters into the equation. There are generally two types of oak used in the production of these barrels: American (which is tightly grained) and Spanish oak (which is more durable and robust). The latter is typically preferred, but these barrels are difficult to export and are pricy. Other distilleries will use other types of oak, but Macallan and Highland Park stick to only these two. American oak is used in two varieties, the first being as ex-bourbon casks and the second in the production of sherry. When Macallan uses American oak ex-sherry casks it actually grows the trees in the US, ships them to Spain, makes the barrels, and naturally air-dries them so that the wood takes on the elements of the air. These barrels are then filled with sherry that’s aged 2 or 3 years. By the time those barrels are filled with Macallan scotch, they would have already gone through a 6 or 7 years maturity process. Only then does the scotch get aged. When tasting Scotches, it is an enlightening experience to find out the details of the barrels used during the aging process. The Macallan comes in two varieties. The traditional line only uses ex-sherry cask, and provides for the rich flavours that Macallan is known for. Showcasing this line, we were privileged with a pour of Macallan 18, a perfect dessert Scotch. Tasting notes include Christmas fruitcake with rich dried fruits, spice, and a long butterscotch finish. The texture is quite creamy and silky, and this is all due to the use of ex-sherry Spanish oak barrels. The 12 and 18 year old Macallan are made in the same style, although the 18 is made almost entirely from first-fill ex-sherry casks. As mentioned earlier, not only is the Scotch aged longer, but first-fill casks also provides for deeper, richer flavours. The 18 is available for $249.95 at the LCBO, while the 12 year old is $89.95. The second line of Macallan is the “Fine Oak” series, best described as a summer Scotch. While the Macallan Sherry Oak is perfect with dessert, the Macallan Fine Oak is best for warm summer days due to its lighter nature. Here we were utterly spoiled, as Marc pulled out the Macallan Fine Oak 25 Year Old that retails for about $750 at the LCBO (The Macallan Fine Oak 10 year old is only $60). The 25 year old blends liquid aged in Spanish oak ex-sherry casks, American oak ex-sherry casks, and American oak ex-bourbon casks. The flavour profile is more green apples, with an acidic punch that works well in the heat, and on the nose is quite floral. If you ever have a chance to taste the 25 year old, go for it. There was silence in the room as we were enjoying this beautifully refreshing drink that was both gentle and complex. The Macallan Fine Oak is an excellent choice for wine drinkers, or those who typically do not enjoy Scotch, for its smooth flavour, and yet it is complex and will have appeal to the Scotch connoisseur. Highland Park grows their barley in the Orkney Islands, the most norther point of Scotland where the winds are so strong that trees do not grow on the island. There is plenty of heather, however, and giving Highland Park that more honey-sweetened flavouring. Highland Park still uses malting floors, a tradition few follow due to the expense of this manual process. Many believe that the Scotch from Highland Park is the most traditional expression of Scotch. Their 18, which uses both Spanish and American oak, has won multiple ‘Best Scotch’ awards. All Highland Park scotches are peaty, with this strong flavour profile intermingling and balancing perfectly with the rich flavours imbued via the aging process, with remarkable honey sweetness and smoky flavours. The Highland Park 15 is produced differently, more in the style of the Macallan Fine Oak line, yet still retaining the brand’s trademark peatiness. There is more American oak used, giving it light summary flavours for warmer days. We were quite fortunate to try the Highland Park 25 Year Old, considered the “True Orkney Experience.” It is bottled at 48.1% giving it more bite, but the purpose of the additional alcohol is to bring out more of the flavours. At first it comes across as a younger Scotch, with warm honey sweetness and peatiness. The finish is gives off a deeper complexity with lingering flavours are that of cinnamon and nutty toffee. You’ll sip this one gently and appreciate every moment. With the 12 year old priced at $59.95 Featured here and the summer-style Highland Park 15 at $84.95, there are affordable choices. The 18 year old is at $139.95, and the 25 year old is not currently available at the LCBO, but it’s sure to be back. Bowmore Tempest 2010 is a 10 year old Scotch that is surprisingly easy drinking, yet due to its 56% alcohol level, will have you on the floor in no-time if you’re not careful. Being aged in first-fill ex-bourbon barrels, the flavours peak immediately and the peatiness adds extra richness to the drink. If you like a strong Scotch without the unpleasant burn, this one is definitely for you. Bowmore Tempest is best had at the start of the night. It’s not heavy and with the exciting flavour profile, it is bound to wake you up. Bowmore distillery is known for producing Scotches that have a strong and refreshing citrus flavour with a honey sweetness. This Scotch is no exception, though it has a higher intensity compared with its brethren. On the nose you’ll need to take a shallow breath to get past the sharpness of the alcohol, but soon enough you’ll get the scent of refreshing citrus, vanilla, green apples and some smokiness. On the pallet, more of those same flavours come through, but it is far smokier, with the addition of caramel notes, spice, and some oak. The lingering flavours are more bitter than sweet. The Bowmore Temptest is $73.95 and at the time of writing this article there are quantities left, but the product has been listed as “discontinued.” This isn’t a surprise, as Bowmore only produces a limited amount of this style of Scotch. This is the second batch, and while the distillery may be releasing a third batch, it’s anyone’s guess if the LCBO will stock it. Arran Distillery is one of the newer distilleries in Scotland, having opened its doors in 1995. They’re a small-production family owned distillery, and they distinguish themselves by avoiding some of the industry ‘shortcuts’ commonly found in more mass-produced Scotches. For example, many distilleries add caramel to give the liquid a richer, darker colour, as there is the belief that consumers associate better quality and taste with greater colour depth. Arran, on the other hand, does not artificially colour their whisky. Secondly, they do not use chilled filtration, another common practice used among some distilleries to create a richer and more vibrant colouring. Some in the industry believe that chilled filtration removes complexity from the drink as it filters out fatty acids and protein naturally occurring in the distillery process. Arran originally broadly released a 12 year old drink which was well received, and has since been replaced with the 10 year old. Also commonly sold is the 14 year old as well as a cask strength scotch. I’m really enjoying their 10 year old scotch, especially considering how affordable it is (just $49.95). On the nose there’s citrus, green apples, and you can practically taste the barley. On the pallet there’s a surprising amount of oak for such a young whisky, leading to a hint of smoke. This gives the dram nice notes of vanilla, allowing for the barley sweetness to come through. It’s a silky smooth scotch that has a sharpness to its finish that’s quick and not too sweet. Compared to the Singleton, featured previously in the Whisky Cabinet, I would say it has a similar sharpness but a deeper complexity in terms of finish. The Singleton has a dried fruit finish, whereas this is sharper and citrusy in a way that’s not too intrusive. At the price point you really can’t go wrong, though I would recommend a few sips to get past the sharpness before you settle into it. If you have another $30 laying around, the 14 year old is a good option at $79.95. You’ll get a fruitier drink that’s not as sharp, with more emphasis on spiciness.